It’s 6:00 pm Friday night, the crew is picking up trash and cleaning the site as the last piece of aluminum is bent and installed on the 15 replacement windows we installed today. As we began to clean up, I walk to the cardboard box holding the white caulk we ordered for the job. I pick it up. Empty. What?! … All that stands between me and a nice pay day, my weekend and my good profit margin is one lousy tube of caulk. My cell is ringing, I have a dinner date at 7 and we are 15 minutes from all the home centers. The local yards close to us are closed. We have three tired guys, including myself, who have labored hard all day and even additional time to maximize profit and finish this job, this day. At this point, all our frustration is due to one tube of white caulk. I could continue and build on this story, because in reality – we have all been there in some shape or form, at one point or another. But there are some things we can gain from this story. First, there are always common items, the things we each use daily. Our ability to be prepared and have these items or tools readily available, and organized, can greatly improve our bottom line in any aspect of construction business. There will always be that time when there is an item needed that you never in a million years would have on your truck. In these cases, you are going to be late to dinner … once in a while. And your wife is going to be mad. But generally, as in anything, we can work to minimize these situations with a little planning and organizing. A tradesman’s truck says a lot about the person operating it. Some will disagree. But to me if a tradesman shows up in a vehicle that carries his tools and materials in an organized fashion, he has already created a good impression. As a homeowner, I am going to feel comfortable that he is a professional. In my mind, the guy who shows up with the huge pile in his vehicle basically makes me think, “This is going to be messy and expensive.” That is – in the sense of … time is money. He is going to spend a lot of time digging in his truck. And I am paying for that time either as an employer, a sub or even as a person hiring the job. The flip side of all of this of course is we can all use our trucks to provide a positive first impression on our clients. At some point, your client will come out to your truck. But more likely – throughout the project actually, so let it speak to your professionalism. Professionalism is a lot of things, and think about it. None of us would like our doctor’s or dentist’s tables piled high with tools and left over parts from the last surgery or root canal, all while they are preparing to see us and do a procedure. 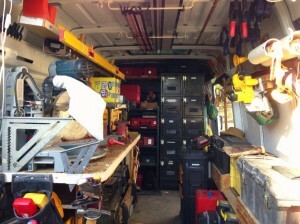 For our customers, their home is a big investment, so create a good first impression with an organized truck. We all know what parts or fasteners we frequently use. And I recommend having a system for storing them, whether it’s steel drawer units mounted permanently, portable plastic boxes, Sortainers, and the list goes on. Maybe it’s a combination of these items, and most likely if your space is limited, it will be. Next, is the common use tools. We all have this grouping unique to us whether you use a Veto Bag or a Bucket Boss, Systainers or maybe a traditional toolbox; we all have a basic set of tools we have mobilized for ourselves. If you don’t, maybe this is a good starting point for proficiency. Finally, the other tools and equipment we carry, such as – extension cords, nailers, power tools, etc. I plan to write an article for the four main types of vehicles used in this industry, followed by a final on unique situation vehicles. First – the traditional pickup truck, second – the service truck or utility truck, followed by – the van and fourth – the trailer. By no means will I be able to cover everything, great time for example could be spent on lettering your truck as well. I realize there is no perfect vehicle and some things I will bring up are things you may already know. Yet – refreshing the mind is a good thing. Great article. Thanks. As you mention, clients are going to have a lot more confidence in you if you show up organized and work in an efficient manner. 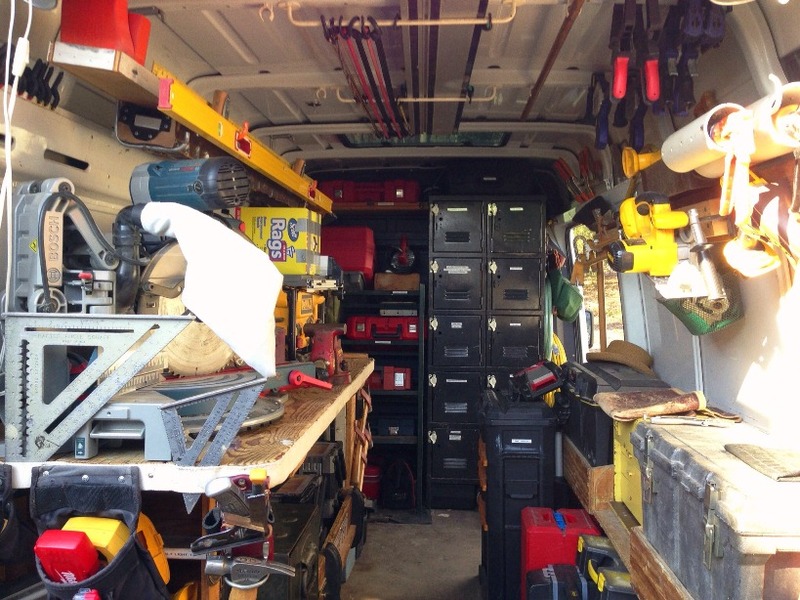 An organized van or truck is important but you also need an efficient way to get the tools to and from the work area, especially if your clients are home while you’re working. 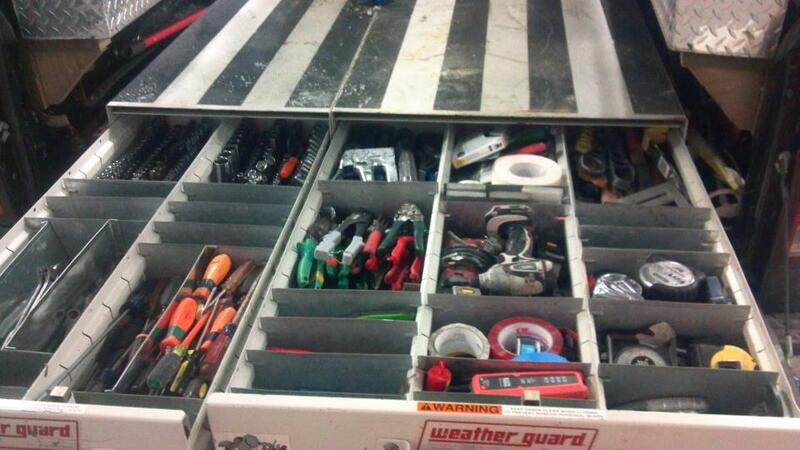 I organize tools into containters, with the most use in some and specialty tools in others, though it took some trial-and-error to figure out which tools belonged in which box. I’ve been using mild crates and tool bags but am switching to the new (I think it’s new) Bosch L Boxx system as it will lend a much more professional image. Something as simple as a setting up a couple of sawhorses with a piece of plywood as a work table is really appreciated by clients even on small jobs. The exact system is less important than getting into the habit of using it every day. If you do, you will find that you save a lot of time and frustration.